The L150R Hand Held Vascular Doppler is an instrument that detects blood flow using the principles of the Doppler effect. It can be a very useful tool in assessing how good the blood flow is to the foot or hand. ABI Hand Doppler test is a painless test and very similar to taking blood pressure using a stethoscope. It is particularly useful for assessment of arterial disease but can also be used for venous problems. This Doppler Ultrasound system is imported from Summit Doppler, USA. Supplied with gel, soft padded carry pouch, ABI BP cuff with Manometer, software for ABI calculation and manual. 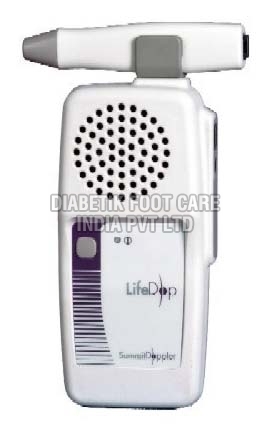 The LifeDop L150R features a non-display, hand held vascular Doppler with superior sound quality, extended battery life, enhanced probe sensitivity, interchangeable probes and one year full warranty. It includes a battery recharging system so you don't have to worry about overcharging or draining of the batteries.